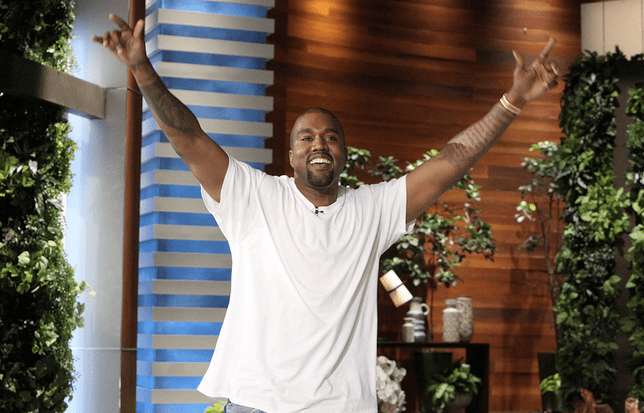 Kanye West went on Ellen DeGeneres’ show today to talk about his family, his career, and what he plans to do next. In some small way, it seemed like, while he often comes across as aloof or misguided, this Kanye had a clear vision of himself in the world of entertainment. In fact, his appearance on Ellen is making me wonder if, for all of the time the world spends bashing him, he really is a genius. We’ve written our fair share of articles outlining the conundrum that is Kanye West (find them here, here, and here). I still think those concerns are valid. And, I am not here to proverbially rewrite Kanye’s troubled history. I am just beginning to wonder if the perceptions of the mega star need more clarity and nuance. The clip below runs 8 minutes long, and on first listen, sounds like the long incoherent ramblings of a misunderstood millionaire. But very few of us have the agency to operate as Kanye does. We have to worry about how we are perceived. We have very real world consequences to living in the fullness of ourselves. For survival’s sake, we have to choose order over freedom. Kanye West just doesn’t operate under those rules. That is the one thing that struck me most in watching this clip. There are very clear moments where it is evident that Kanye is not confused or erratic. He is able to coherently speak on topics in an intelligent, dare I say insightful, manner. Let’s investigate a few of his comments. I believe that at one point or another, we all feel this way. We all think “if I just had the money or time or support, I could bring about the change the world needs”. And knowing the circles that Kanye travels in, I can only imagine how infuriating it would feel to see massive sums of money not be put toward better use. Assuming that Kanye is being truthful in saying that his business ventures aren’t about filling his pockets and actually have altruistic end goals like taking away bullying, we could be looking at him all wrong. We could be playing checkers while he is playing chess. Our analysis and criticism might be on too small a scale to fathom the vastness of his objectives. This could be real. It is a wonderful blessing to know that you are called to achieve something great. Still, the weight of that burden can be oppressive. Here, Kanye sounds like he is very aware of what he is meant to accomplish while on this earth. And for all of his zaniness, he is devoted to fulfilling his destiny. I can’t hate on that. I may not understand it. It might not be in service of me directly. But who am I to make fun of someone with a dream and an undying passion to make it happen? Can we just take a moment to applaud how woke Kanye sounded for a moment? He referenced #OscarsSoWhite and blasted those that might not take it seriously while being interviewed on the #1 daytime TV show. And if that wasn’t enough, this snowballed into the name dropping of rappers Rakim and Phife Dawg blended with Rakim and Lauryn Hill lyrics. I just know every white woman watching at home was some combination of confused and scared having their sacred Ellen sanctum being violated with the lyrics “I ain’t no joke, I used to let the mic smoke. Now I slam it when I’m done and make sure it’s broke”. And to be honest, he went a bit off the rails here. But it reminded me of that person that just has so much to say that when they get the chance to express themselves, it’s an incoherent stream of words and thoughts. That person isn’t crazy or wrong, but complex thoughts can’t easily be distilled down into soundbites. Maybe we should stop trying to see Kanye as a non-complex individual. He might just be too complex for us to interpret at times. While he didn’t couch it this way, his words resonated strongly with the hardships of “living while Black” in America. Rowan Pope on Scandal, played by Joe Morton, once scolded his on-screen daughter saying “You have to be twice as good as them to get half of what they have,” and Black America implicitly understood. Kanye imparts that same message here, only pairing it with the ridicule he constantly faces for being himself. At the end of the day, Kanye really can’t escape the barriers that many of us face by virtue of being black. No matter how rich he is (or isn’t). A failure for him has much more weight than the failure of one of his white counterparts. Makes you wonder: should we be so critical of someone who, whether we like it or not, can open doors for other creative-minded folk? People always relate the black experience and being “woke” to the movie The Matrix. We collectively say that when you wake up, you can see the whole world for what it is, and we have to fight to wake up as many other minds as possible. But let’s take that line of thinking a bit further. What if, after waking up, we have to go back into the Matrix and are forced to make the decision to either follow order or eschew it all together? I believe that if we really made the decision to fight the power, we’d all look a lot more like Kanye West. So, maybe we’re all the fools, mocking him for his latest Twitter rant or eye color or performance. Or maybe, he’s just crazy and I went down the rabbit hole with him. Both are equally likely. Watch the full clip from Ellen below.